Metallic Merry and Cara Brewer matched their 220 in the first round with a 220 in the second to take the lead in the first day of Open second-round competition Wednesday at the Jerry’s Chevrolet NCHA Futurity, presented by Great American Insurance. Their cumulative 440 put them half a point ahead of Tatum Rice on Hashtags who marked 220,5 and 219 for a 439.5. Metallic Merry is a bay roan mare bred by Cindy McIlvanie and owned by Michelle and Michael Merkley of Peoria, Illinois. 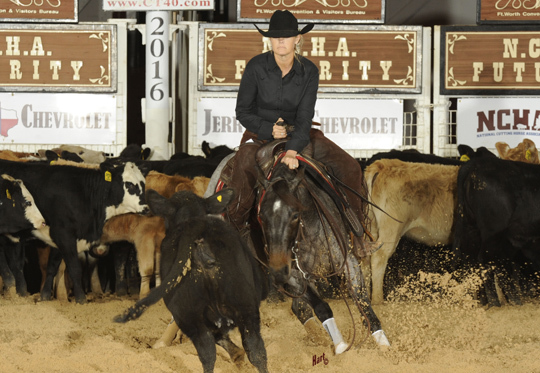 She is by Metallic Cat out of Playguns Star, a Playgun mare that Cara Brewer’s mother, Sue Barry, rode to fifth place in the 2001 NCHA Non-Pro Futurity. Playguns Star earned $115,000 and has produced five money earners, including Stars And Cats, a three-quarter sister to Metallic Merry that Brewer rode to the Breeders Invitational finals. Brewer, who has earned more than $900,000, won the 2004 NCHA Super Stakes on Playin Tag. She is a two-time NCHA Futurity finalist, in 2004 and 2008. UPDATE: Metallic Merry’s score held up to lead after the second round of the Open. Sixty-four horses marked 432.5 or better to advance to the semi-finals, scheduled for Friday, December 9.